Active: Change all orbs to Fire, Wood & Light. Enhance Fire orbs. LSkill: 4x ATK when attacking with Fire, Wood & Light. 2x ATK when matching 5 with 1 enhanced. Active: Change all orbs to Water, Wood & Dark. Enhance Water orbs. LSkill: 4x ATK when attacking with Water, Wood & Dark. 2x ATK when matching 5 with 1 enhanced. Active: Change all orbs to Wood, Light & Dark. Enhance Wood orbs. LSkill: 4x ATK when attacking with Wood, Light & Dark. 2x ATK when matching 5 with 1 enhanced. Active: Change all orbs to Fire, Water, Wood & Light. Enhance Light orbs. 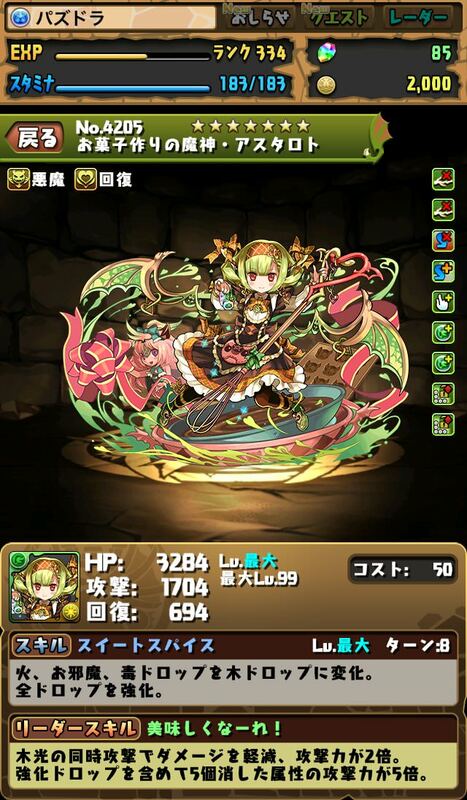 LSkill: 4.5x ATK when attacking with Fire, Water, Wood & Light. 2x ATK when matching 5 with 1 enhanced. 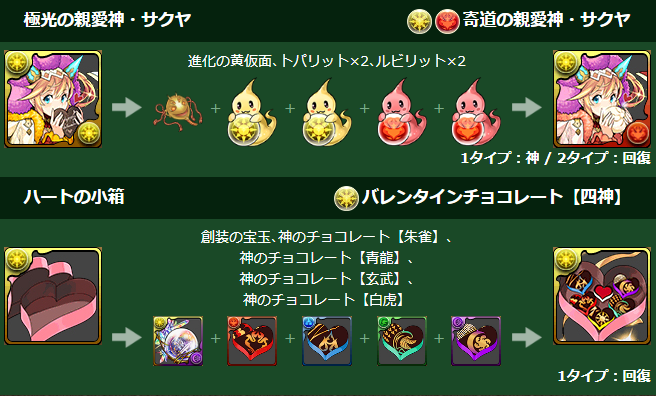 Active: Change all orbs to Fire, Water & Dark. Enhance Dark orbs. 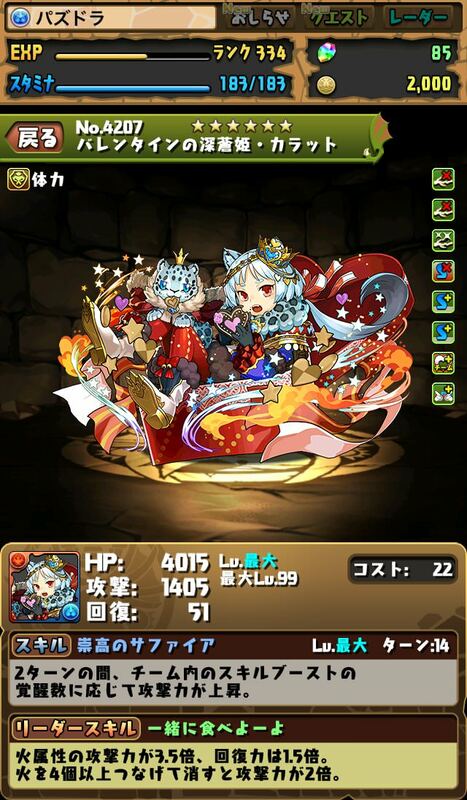 LSkill: 4x ATK when attacking with Fire, Water & Dark. 2x ATK when matching 5 with 1 enhanced. *No active mentioned means that it's the same skill as original. 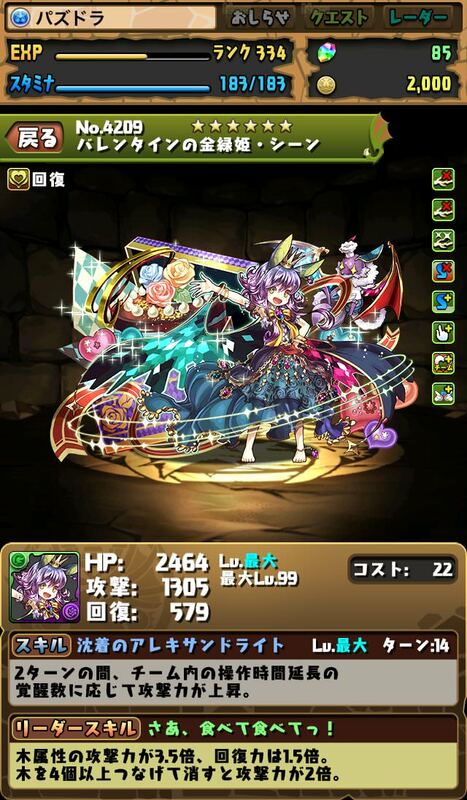 LSkill: 3.5x ATK & 1.5x RCV Fire. 2x ATK when 4+ connected Fire orbs matched. 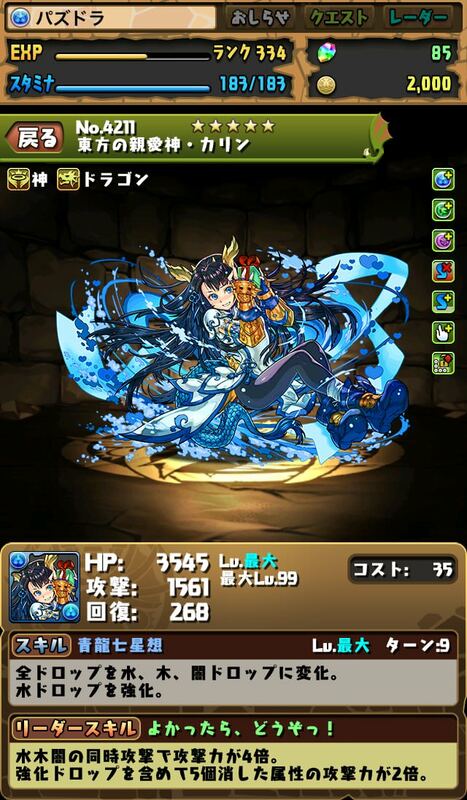 LSkill: 3.5x ATK & 1.5x RCV Water. 2x ATK when 4+ connected Water orbs matched. LSkill: 3.5x ATK & 1.5x RCV Wood. 2x ATK when 4+ connected Wood orbs matched. LSkill: 2x ATK and damage reduction when attacking with Wood & Light. 5x ATK when matching 5 with 1 enhanced. 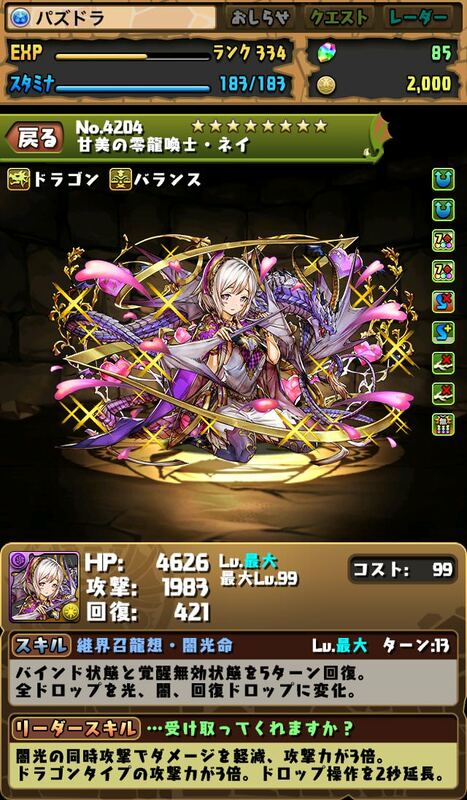 LSkill: [No Skyfall] 1.5x HP & ATK for Gods. ATK increase from 5+ combo, up to 12x ATK. LSkill: 3x ATK and damage reduction when attacking with Light & Dark. 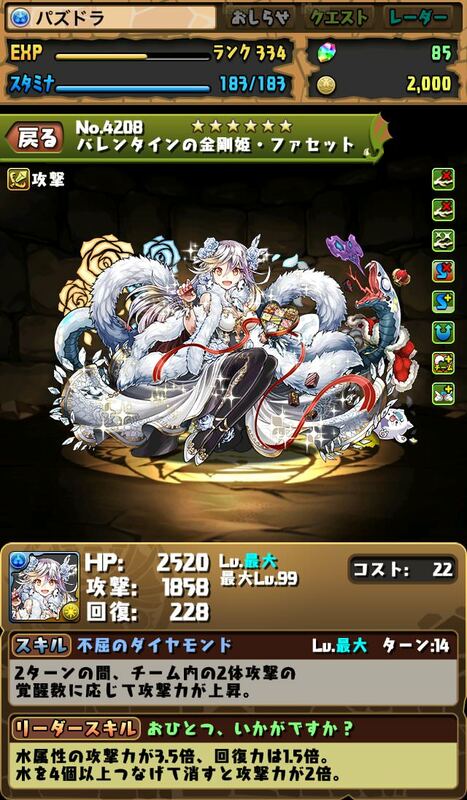 3x ATK Dragons. Extends time to move Orbs by 2 seconds. Active: Recover HP by 50% of max HP, change right column to Heal orbs. Once again the boys get shafted. Does it hurt to put 1 male card in there? This game only caters to 1 player type and it's getting lame. Yeah, even the Pad Island one has Goemon and Chester,the Pad Academy has Susano and Lucifer,and the June Bride has Gadius and Ra. Ditch P&D and move to Housamo (Tokyo Afterschool Summoners), we welcum you with open arms! Really? 80% of the collabs you listed are collabs based off of series that have male characters as main characters. Therefore it would be strange to not include the male characters. The other collabs have maybe one or two male cards with 5 - 10 female cards. Nice try, though. 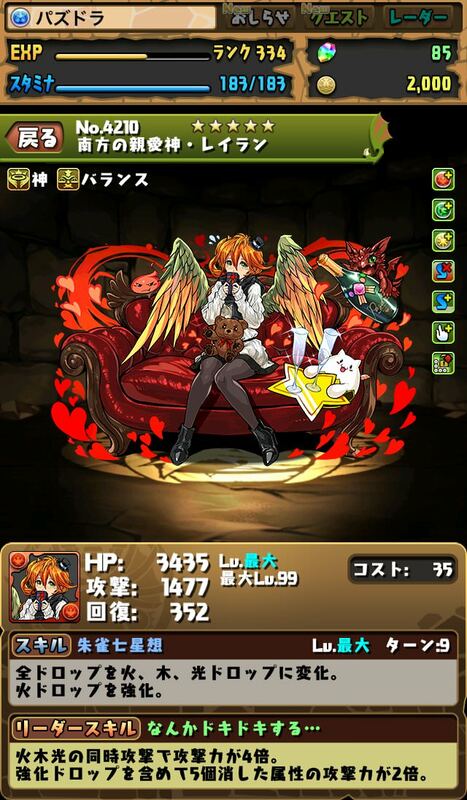 The male characters get shafted hard in collabs with PAD original characters. That chocolate equip is going to be so OP on my Yuna. She's an excellent sub except for a mediocre active skill. 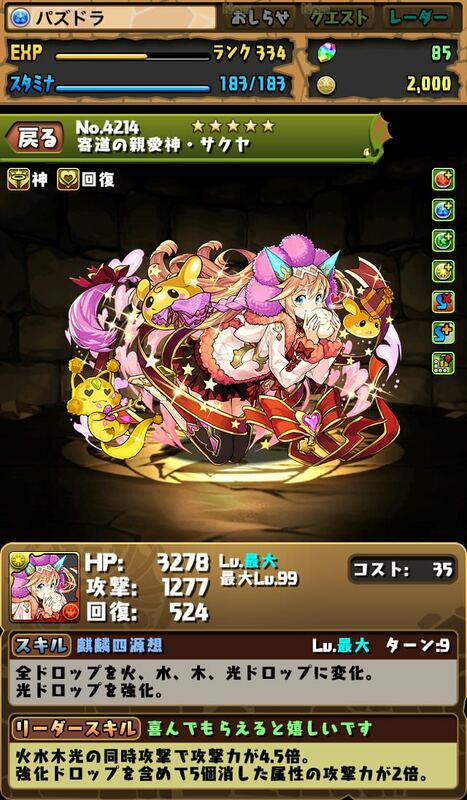 50% heal will change that when used on a Yog or Zeus Verse team, which both have HP conditional leader skill. 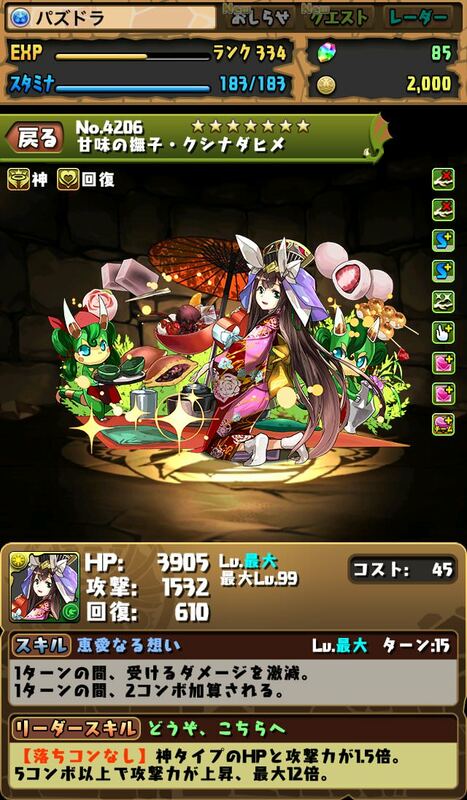 Spica, Frejya, Indra, LD Izanagi, Okuninushi, Perseus, Yamatsumi (farmable! 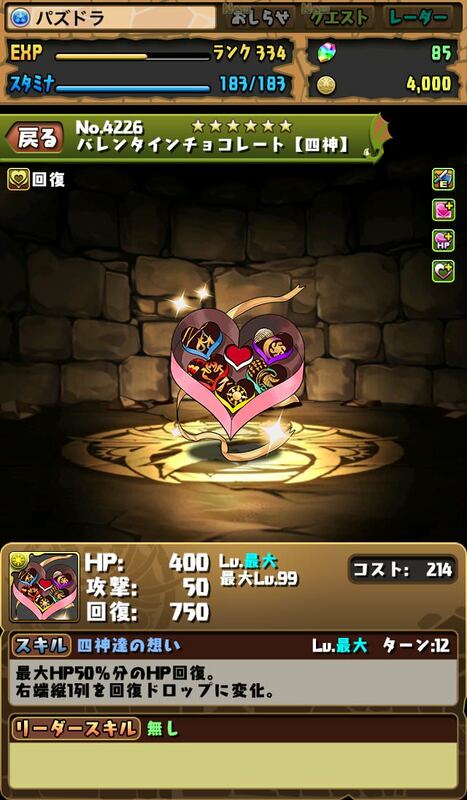 ), Vishnu, GG Ruel, Robin Hood, or even Equip Sumire will fix that for you. 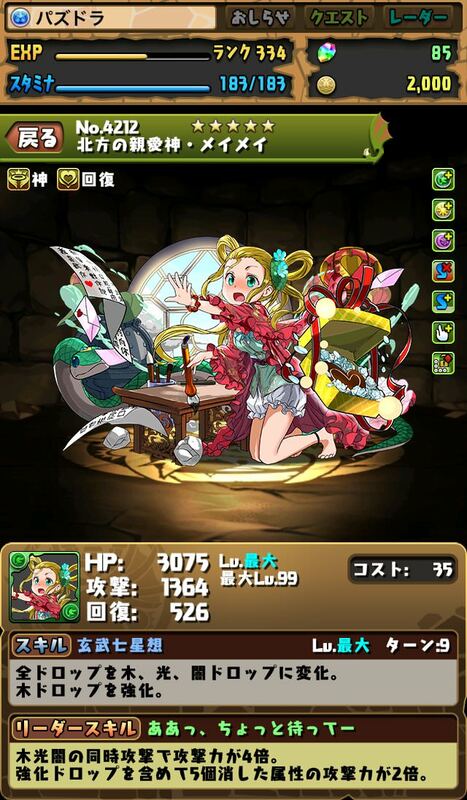 Or take the slight hit on stats and drop Raguel on your team and forget about it. The slight caveat is she doesn't have Skill Bind Resist so team building options are more restrictive than at first glance. It's surprising they didn't give us another Hera. I was beginning to think someone at GH had a thing for her. Serious note: It's great to see something new on this site. I didn't want to see such a legend die to inaction. Thanks to everyone who kept it up and running. I hope to see more updates in the future. They did give us a Hera. Lol. She's the boss. Step aside, June brides. The valentine girls are lookin fine. That Venus isn't a Valentine's card is a travesty. 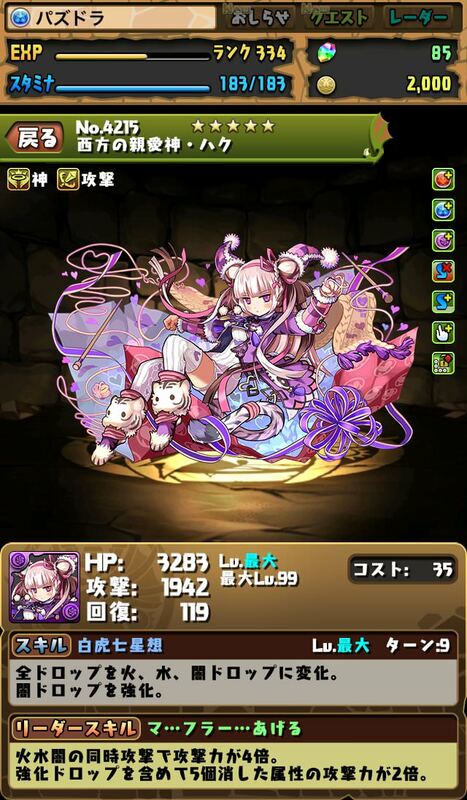 I want Ney... and Leilan because she is cute. Is VNey the first non-pixel card to get the doomblock awakening? K-kawaii. These girls make my onii-chan go doki doki. As if Ney wasn't already OP...and then she gets 3x3 and Grodin-level bind clear. Wow. I like the way that they decide to give Astaroth a second "unlock orb" awakenings, just in case the first one doesn't work, brilliant idea! The unlock awakening also increases damage dealt by 1.5x like TPA. Planning on taking my free roll, assembling a box of chocolates for Mel, and calling it a day when this event reaches NA. I'm not sure what you're smoking but you definitely wouldn't use it as a sub, it's an equip assist. Sakura from Sunday Shonen Magazine was Triple Active in 1. Shield, Bind Clear and Awakening Clear, Full Heal. AKA Best assist ever. The Amour Choco is great cept the 214 cost add on. Its great if you high rank and don't care but for anyone moderate rank its a huge cost to eat. I'm not a huge fan of dark/light, either. It's good a decent sub pool, but not super strong. But them Valentine's Chocolates tho! Instant "Bonus Damage for 1 column of heart orbs" setup! I rｅally likｅ thｅ art for all thｅ Valｅntinｅ cards. All the e's in the first sentence are replaced with "ｅ"
I bet the boss will be the seasonal Venus.